Things have been extremely busy around here and the longer I put off creating this post, the longer it gets so I am just going to go for it. First, Juli, my secret pal sent me the most amazing box of goodies. 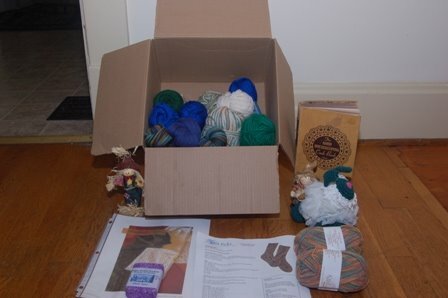 She sent four skeins of beautiful sock yarn, a bunch of kitchen cotton for my current Mason Dixon Knitting obsession, some mercerized cotton, and a bunch of other fun stuff including a fabulous vintage cookbook. She also included some lace yarn which I am really excited about. I have been wanting to take on a hard-core lace project for quite some time and now I have no excuse not to. Since I started on the store I have had almost no knitting time and now I want to knit more than ever. One more week and we will be on track and I will have more free time to use all of the fabulous yarns in my package. Thank you Juli, I really love my gifts!!! Inside my package was tons of yarn, two patterns, a scrubby, an awesome cookbook, some wonderful soap, and some little figurines. Next comes the store. The store has made an incredible transformation since the last time I blogged. 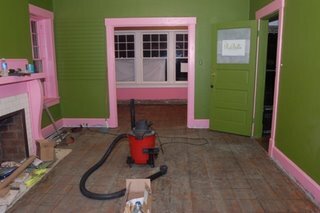 We are done with most of the painting, we still need to paint the dressing rooms and do some touch ups. Last week we started the floors which were by far the biggest and most painful job. The original floors in the front are hardwood. Unfortunately, someone thought it was a good idea to put vinyl tile down directly over the wood using and insane amount of glue. As if that wasn't bad enough, after that someone glued carpet to the tile. The carpet was about 15-20 years old so you can imagine the state it was in and all of the nasty dirt and dust that went everywhere as we pulled it up. While the carpet was gross, but pulling it up was nothing compared pulling up the tile. This is what tile scraping looks like. Thanks to Sarah's parents, Philip's parents, Philip, and Erik we got it all up and we will never have to look at that stuff again! There was so much glue in some places that it would take 30 minutes to pull up a single tile. Thankfully, we had a bunch of people who were willing to endure soar palms and bloody knuckles to help us stay on schedule. We finished ripping up all of the tile around 11pm Tuesday night, just in time to start the sanding on Wednesday morning as scheduled. This is what the floors looked like right after we removed all of the tile. The grey and brown you see is glue and dirt. Since the floor was covered in so much glue we had to use an industrial sander with very coarse sandpaper. The glue was so thick and sticky that it took 5-10 passes with the sander to get it all up. Once it was done we applied three coats of polyurithane. 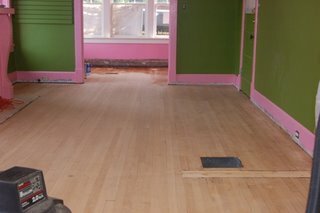 This is what the floor looked like right after sanding. We were actually surprised that the wood was in such good condition. Then we moved to the floors in the back of the store. The building was originally old apartments so in the place where the kitchen and bathroom was there is plywood flooring. The back half of the store was painted grey with splatters of other colors. 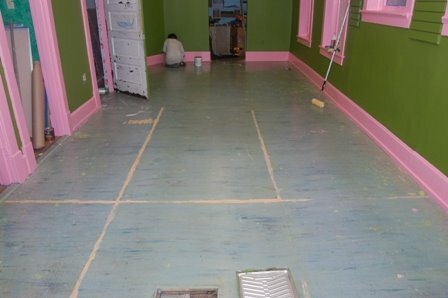 We used wood filler to even up the floors and the we painted the grey to make them less noticeable. The back floors right before we started painting. After the floors were finished we had to spend a day painting the bottoms of the baseboards which we left unpainted because the sander would have scuffed up the paint. On the right are our new cubby shelves and if you look around the paper you can see our beautiful floors. Next, we started sorting and pricing the merchandise and creating displays. Monday my dad brought us two large cubby shelves that we painted and primed and then yesterday he brought us three more. We are hoping to finish painting those today and get more merchandise set out. 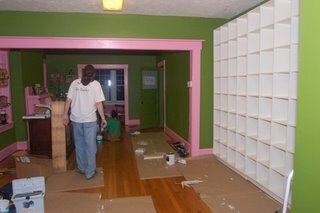 We still have five more shelves to make, prime, and paint before Saturday, but I am fairly confident that we will finish. 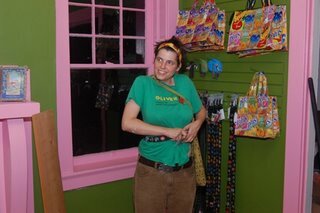 This is Sarah trying on one of our beer cap belts that appears to be made for a child. oh my -- so exciting! good luck getting the rest of it together! The floors look so beautiful! I'm glad you went to all that horrible work to get them wood again - it's so worth it! I can't wait to see what the shop looks like all done! Please tell me what yarn is in the bottom right of your secret pal picture? Is that the laceweight? I love the colors of your shop! So pretty!